Our Founder-President, Kurian John Melamparambil was born into a traditional business family, 'Melamparambil' in Thiruvalla, Kerala as the second son of Late. Mr. M. V. John and Mrs. Leelamma John. On May 28th, 1978, in the prime of his youth, the sudden and shocking demise of his father due to a cardiac arrest shook his life. It made him stop, think and realize the value of life. As it was a Sunday, his family could not give his father the kind of treatment, which could have perhaps saved him. His father died soon after he had the attack. The dying man's last words were, "Oh God! free me from this pain". These last words of his father made a lasting impression on his son, Kurian John Melamparambil. The loss of a father, friend and guiding figure for him was the beginning of the thought process that led to his humanitarian activities. His helplessness in not being able to do anything that could stop his father's untimely death made him think of ways by which he could help in preventing others from suffering a similar fate or loss. This idea that was born in that tragic moment lingered in his thoughts and laid the foundation for the starting of a noble venture. 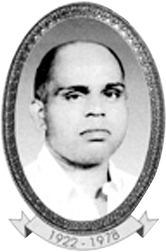 On 10th September 1986, Kurian John Melamparambil formally started the Melamparambil Varghese John Memorial Charities (M.V.J.M. Charities) named after his father, late Sri. M.V. John. The main objective of the Organization is to help and support poor and needy patients by providing medical treatment for their ailments. All patients who approached him were given treatment irrespective of caste, creed, religion or any kind of prejudice. He made it a point to ensure that whosoever approached him was given treatment, and eventually made self-dependent in their health to the maximum extent possible. Scholarships were given to deserving children of the patients, and housing, clothing and food to their dependents during the period of treatment when required. During this time, he worked as the head of Personnel & Administration division in the Cochin Unit of Malayala Manorama, a leading Malayalam daily. From a portion set aside from his salary, he expanded his activities without any publicity or fanfare. As the activities of Melam Foundation progressed and grew rapidly, Kurian John Melamparambil felt the constraints of his own resources and realized the need for urgent funds. He strongly felt that these funds should be generated through some venture of his own. This intense feeling coupled with meticulous planning resulted in the establishment of a small-scale industry named M.V.J. Foods under the brand name MELAM —for a range of foods products in the year 1992, giving up his job at Malayala Manorama. Melam was launched by neither taking loan nor investing any of his personal savings. His business plan was modelled with operating and financial measures which helped him to generate more than enough money for launching the business with the best in class products and eye-catching advertisements - a perfect example of 'bootstrapping'. His business plan was modelled with operating and financial measures which helped him to generate more than enough money for launching the business with the best in class products and eye-catching advertisements - a perfect example of 'bootstrapping'. He is one of the few in the country who have implemented the principle of 'bootstrapping' in its full essence. Thus, a major portion of its profit was shared with the less fortunate in the society. As the business progressed, the income of Kurian John Melamparambil increased, which was channeled directly to the fund which resulted in the increased activities of Melam Foundation Today, Melam Foundation has provided treatment to more than 1,56,000 poor and needy patients around 1000 hospitals. In addition to this free lunch was provided to 15 Lakhs poor patients in Govt. Hospitals of Thiruvalla for the last 16 years. The main purpose of creation of Melam business was to generate funds for expanding and running the Foundation. Kurian John has managed to keep Melam Foundation independent of any external funds. Kurian John considers 'Melam Business' as a rocket or launch vehicle for launching the satellite 'Melam Foundation'. He felt that Melam Foundation had reached its orbit safely and it was time for Melam business to be separated from Melam foundation, like the rocket separating from its satellite. After about 5 years of scrutiny, he struck a deal with a well-known business house with high values in terms of ethics and quality to hand over Melam business to focus more on humanitarian and social activities.